Review date: 5 March 2002. Flash memory cards are finally becoming a useful storage system for normal computer users. Flash memory always was useful, of course. Memory cards are functionally shockproof, don't care about magnetic fields, and come in form factors that let you fit at least several cards in a matchbox. And flash cards' data transfer speed has always been pretty good. But memory cards used to cost too much for this to matter, if you wanted a card with enough capacity to store more data than a pocket full of floppy disks. Only a year and a half ago, a mere 64Mb CompactFlash card cost more than $AU4 per megabyte. Larger capacity cards existed, but were even more expensive per unit capacity; you had to be pretty darn enthusiastic about your digital photography or mobile MP3 listening to shell out for good-sized memory cards. Using memory cards for plain data transfer - toting ordinary files from work to home, for instance - only made sense if an 8Mb card was big enough. If you had a lot of money to burn then you could buy enough flash memory to choke a heffalump, of course, but it still didn't make sense, compared with using a far cheaper Zip drive. 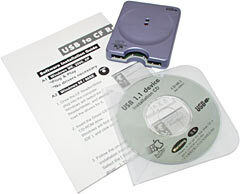 Furthermore, if you wanted to use your flash cards with computers you hadn't previously visited, then you had to carry around not only your card reader (they're usually just called "readers", even though they can write, too), but also a floppy disk, to install the drivers for the reader. If you put the card reader drivers on a memory card, you're likely to feel a bit of a dill. That was then, this is now. If you want up to 512Mb of storage that takes up close to no space at all, and if you want a drive to suit that storage that'll work on various Windows flavours (and perhaps some other operating systems, too) without a driver, then a flash memory solution beckons. You still won't pay a trivial amount of money to get this happening, but memory cards and readers are now cheap enough to be a real alternative to, say, Zip drives, at least for relatively small amounts of data. The format to go for here is good old CompactFlash. SmartMedia (SSFDC) has its place, and is used in lots of digital cameras and MP3 players, just like CompactFlash. But you can't yet get SmartMedia cards bigger than 128Mb. SmartMedia also costs a bit more than CompactFlash; sure, SmartMedia cards are very very thin, but Type I CompactFlash cards are only 3mm thick, so who cares. Higher capacity SmartMedia cards will probably be along soon enough, but (very expensive) 1Gb flash memory CompactFlash cards exist now. No other format is in the running for general cheap(ish) memory card purposes. Sony wants everyone in the world to use Memory Stick, but their format has the same size limit and price problems as SSFDC. MultiMediaCard and its copy-controlled relative Secure Digital are tiny even by SSFDC standards, but they only come in sizes up to 128Mb, too, and a 128Mb MMC costs more than a 256Mb CompactFlash card. 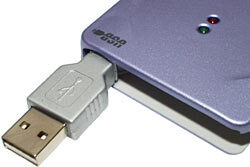 There are stand-alone "key-ring" USB flash memory storage devices, too, but they always cost a lot more than a memory card with the same capacity plus a reader, they can't be upgraded, and they can't be used for anything but file storage; memory cards can be plugged into cameras, PDAs, MP3 players and so on. Plus, key-ring storage widgets really aren't that much smaller than a CompactFlash card, plus a small reader. Like, for instance, this one. This is Skymaster's DRV-0262 Mini CF Card Reader. It's 67mm long by 52mm wide by 14mm high (2.6 by 2 by 0.6 inches). It weighs... not much. And, here in Australia, Aus PC Market are selling it for a princely $AU48.40, delivered. Skymaster's page for their USB storage devices is here, but the "More..." link for the DRV-0262 is not actually a link to anything, as I write this, so there's not a lot of point going there. That doesn't matter much, though, because there's not a lot to learn about this product anyway. To plug the reader in, you swing out the USB connector from its home in the back of the casing. The stowable connector is similar to the one on the three-flavour EagleTec reader I reviewed recently here; it makes the reader more compact, and should keep dirt out of the plug, too. The offset connector is handy; it means you can plug this reader into the leftmost socket of a USB hub and not block any of the others. Or, of course, you can use a USB A-to-A extension lead and connect the Skymaster reader like a normal cabled unit. No extension lead is included, though. Along with the DRV-0262 itself, you get a manual sheet that you probably won't need, and an 80mm CD-single-sized driver disc that you also probably won't need. This is because this reader, like many others these days, is a USB Mass Storage Device; you just plug it into a Windows ME, 2000 or XP box and the OS installs a built-in driver for it automatically. Bing, one new removable drive. The mini-CD (which should work in any tray-load CD-ROM drive made after the invention of masonry, but won't work in quite a few slot-load drives) contains drivers for Win98 and Mac OS 8.6 and 9.x. The PC part of the disc also has an "XP" directory, which just contains a how-to-install document. In the olden days of, oh, a bit more than a year ago, there was a reasonable chance that a dirt cheap USB card reader like this would have significant, um, performance issues. All USB card readers so far have the same 12 megabit per second peak bandwidth available to them - USB v2.0 can run a lot faster, but few computers have USB 2.0 capable ports, and to my knowledge no card readers support 2.0 yet, either. So everything runs at USB version 1 speed, and can theoretically shift about a megabyte of user data per second. But the worst USB card readers can run at less than a fifth of the speed of the best ones. The little Skymaster reader doesn't have such problems. When reading or writing large files (10Mb or more), it managed a transfer rate of around 900 kilobytes per second. The smaller the files, the slower the reader; a bunch of files averaging 35kb in size moved at only 160kb/s. That's a problem of file systems and storage devices in general, though; this is not a slow reader. The Datafab reader I review here is $AU52, ex delivery, from m'verygoodfriends at flashmemory.com.au. I like it a lot, I use it all the time, it's roughly the same size as the Skymaster reader, and it's a hair faster for reads - less than 10%. For writes, it's the same speed, and the small read speed advantage isn't anything to get excited about. Both readers are also compatible with the fatter Type II CompactFlash cards, so you can use them to read IBM Microdrives. So, in brief, the Skymaster reader is a good product. What comes next, though, is finding a good card (or cards) to use with it. "Good", in this case, may be taken to mean "unlikely to cost more than asking an Outsider a personal question". For a while, there seemed to be three kinds of memory card dealer. First, there were the camera stores, electronics stores and plain rip-off artists. They sold memory cards for the full list price, even if that list price hadn't been updated for two years. Then, there were the computer stores and other reasonably savvy retailers, who sold flash cards (usually big-brand ones) for considerably lower, but still quite hefty prices. Then, there were the eBay crowd, from whom you could get an off-brand memory card for maybe half as much as anybody else would charge for a Sandisk one. Buying memory cards on an auction site is not a terrible risk. There's not a great deal that can happen to a CompactFlash card, in its packaging, in shipping. Even if a questionable dealer's selling cards that fell off the back of a truck, at least you know the fall isn't likely to have hurt them. As long as you don't buy from someone shonky (only three feedback messages, two of them unfavourable...), and as long as you don't catch Bidding Fever and pay more than retail, on-line auctions seem likely to give you an OK memory card for your money. But lots of people don't want to visit the flea market of the Internet, no matter how tempting the prices. Fortunately, things are getting simpler now. The hilarious-price brigade are still trying to shift flash memory for much more than it's worth, but you can also get cards at near-auction-site prices from more normal mail order places. Like, for instance, Aus PC Market, and a couple of other Aussie dealers. The last memory card I bought was a Ridata "256Mb" (243Mb actual formatted powers-of-two megabytes capacity) CompactFlash, for which I paid $AU242 including shipping from "MemoryPower" on eBay, in November 2001. MemoryPower has a Web page here and an on-line store here, but prices haven't exactly plunged in the last few months. In fact, 256Mb Ridata cards in their on-line store are currently $AU261, including Australian delivery. Aus PC Market, on the other hand, now have 256Mb EagleTec CompactFlash cards, delivered, for $AU253. A 128Mb EagleTec card from Aus PC Market is $AU159.50 delivered, though; you can get a Ridata one from MemoryPower for $AU129 delivered. 64Mb cards from both suppliers cost about the same - $AU82.50 from Aus PC, $AU85 from MemoryPower. Aus PC aren't stocking 512Mb cards; MemoryPower are, and have them for $AU563.50 delivered. Flashmemory.com.au are currently selling 64, 128, 256 and 512Mb SanDisk CompactFlash cards for $AU92, $AU157, $AU320 and $AU976 respectively, not including shipping. 64Mb price OK but not exciting, 128Mb price not too bad either, 256Mb price a bit on the steep side, 512Mb price downright ridiculous. And those are just the regular SanDisk cards; the faster "Ultra" models cost even more. CompactFlash is SanDisk's standard, so their cards ought to work in everything without exception, and a 25%-or-so price premium for a 256Mb card isn't that bad. But a 75% premium for a 512Mb one is a bit rich. Especially when the SanDisk 512Mb cards, possibly because they came out before anybody else's, are slower than the off-brand competition, according to this comparison. To be fair, the speed differences aren't actually likely to matter. They're real enough, and can be quite large; that's why various bigger-brand memory card makers (like Lexar, for instance) keep making a big deal about their new and faster models. As the abovementioned Digital Photography Review comparison shows, read speeds range from about 2 megabytes per second to more than 4Mb/s, and write speeds vary from under 1Mb/s to more than 3Mb/s. If you're not using a card reader connected to your PC via a fast interface, though, the differences are irrelevant. You need the bandwidth of FireWire or IDE if you want to see the full potential of a fancy top-spec memory card. If you're using a use USB v1.1 reader, you won't see anything more than about one megabyte per second, no matter what card you're using. The slowest memory cards on the market today are all likely to be faster for reads and writes than a USB v1.1 reader/writer can handle. The memory card interfaces in other devices - digital cameras, in particular - aren't too likely to stretch the capabilities of many cards, either. Thanks to the amount of processing they're doing, even professional rapid-shooting digital still cameras can only dump a couple of megabytes per second of data onto a card. There are performance differences between different cards, probably because the cameras aren't writing data continuously, but most cards on the market today seem to be within about 25% of each other. Only the very slowest ones (like, ahem, Sandisk's non-"Ultra" cards...) are bad enough that you'd easily notice the difference, even with a pro camera. You might get considerably better in-camera image review speed from a faster card, perhaps, but that's about it, unless you've bought a real dog. Speed, therefore, is not likely to be a big deal. Compatibility is another issue. A cheapo card that's not quite made to specification and thus causes your digital camera to crash, or doesn't give you back at home quite the same data you copied onto it at the office, is not a card that you're going to enjoy owning. Ridata cards don't seem to be much of a risk. You can find horror stories about every type and brand of digital media if you search Usenet and photo site forums, but isolated reports may or may not mean anything. Lots of Ridata cards have been sold, and lots of people - including me - are using them quite heavily with no trouble at all. So they seem a safe bet. EagleTec cards are more of an unknown quantity. I haven't done any proper compatibility tests with EagleTec cards myself, and there's not much about them on the Web or Usenet. But they're not a brand new product. If they stunk, somebody probably would have noticed by now. Nobody seems to have done so. So I wouldn't be worried about buying one. There are a few generic CompactFlash brands besides EagleTec and Ridata, of course. US residents looking for cheap cards could probably do a great deal worse than check out NewEgg.com's "Mr Flash" range. They may sound as if they come from the same manufacturer as Mr Sparkle, but Mr Flash is another mystery brand that's been on sale for some time without a mass uprising against it, so they're very probably fine. A 512Mb Mr Sparkle card's $US190 including American delivery, at the moment. Can't argue with that. Let's presume you want about 250Mb of portable storage. One "256Mb" memory card and one Skymaster DRV-0262 from Aus PC Market will set you back $AU301.40, delivered in Australia. 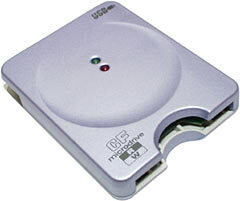 The most popular removable storage option in this size bracket would have to be the "250Mb" Zip drive (real formatted capacity about 238Mb). Which, if you shop around, costs maybe $AU330 including one disk, with extra single disks for it about $AU30. So CompactFlash is a little cheaper if you need the capacity of one Zip 250, but a lot more expensive if you need much more than that. On the other hand, CompactFlash is, well, compact. A reader and a 256Mb card has no more bulk than a Zip disk. And CompactFlash is shockproof, and magnet-proof, and can be used in other devices. Plus, a weeny little silent card is just plain cooler than a buzzing 3.5 inch drive. It depends on what your needs are, but a CompactFlash portable storage setup probably isn't a Revolutionary Product You Have To Have. And if you don't buy now, this gear will surely be cheaper soon enough. But it works now, quite elegantly. And the price isn't ludicrous any more. So Star Trek storage can be yours, today. I can't see anything bad about that. Can you? Readers from Australia or New Zealand can purchase memory cards and readers from Aus PC Market. MemoryPower sells Ritek cards in Australia.